The Finnish company now enjoys support from several tech founders, athletes and celebrities. Oulu, Finland-based Oura Health, maker of a sleep- and activity-tracking smart ring, today announced that it has surpassed $20 million in total funding. Based on its previous announcements, this would mean that the company has raised roughly $6.5 million or more in new funding since its most recent round in July. While the latest round was led by MSD Capital, it also featured YouTube cofounder Steve Chen; Twitch cofounder Kevin Lin; Sunrise founder Dave Morin; and a number of unspecified investors with tenure at Skype, Box.com, Casper, Soylent, Oak, JUMP and Freefly. Also participating in the round were Will Smith and Keisuke Honda (through the Dreamers Fund), authors Neil Strauss and Sam Harris, chef David Chang and a laundry list of professional athletes including Drew Brees, Apolo Ohno, Shaquille O’Neil, Jimmy Johnson, Lance Armstrong, Manu Ginobili, Nick Foles and Earl Thomas. The Oura ring hosts a number of different sensors designed to monitor the wearer’s health while they sleep or engage in physical activities. These include an NTC body temperature sensor, infrared LEDs to actively measure blood volume pulse and an accelerometer and gyroscope to detect movement. The wearable feeds all of these readings through an accompanying app that generates insights and behavior change suggestions for the user. This latest funding announcement comes roughly eight months after Oura released the second generation of its wearable activity tracker. The updated version is smaller than its predecessor, and includes customization features. It’s safe to say that Oura is among the most fashionable smart health accessories — it was only a couple of months ago that Prince Harry made headlines for wearing the ring during a royal tour. Alongside their money, the new sponsorships from so many well-known names will likely have a substantial impact on the device’s success, especially among consumers. A number of companies have been taking cracks at the idea of a health-conscious smart jewelry over the years. 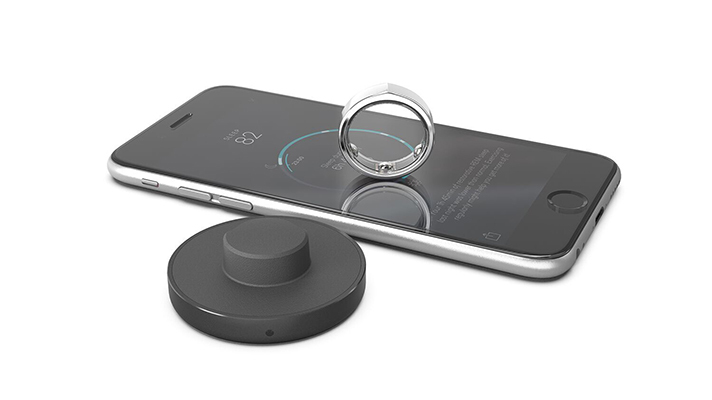 Motiv offers a selection of smart rings that can interact with various fitness apps, while New York City-based Ringly offers connects rings and bracelets designed to increase wearer’s mindfulness.